Living in New York City can be many things: exciting, dynamic, culturally rich, god awfully expensive. But one thing it is not for most people is natural: unless you live directly on a park, your everyday exposure to nature might be limited to a handful of sidewalk trees, used as much for canine territorial outposts as natural beautifiers. But if the Green Line by Perkins Eastman Architects goes through, connecting with nature in one of the most concrete-laden lands in the world might get a lot easier. 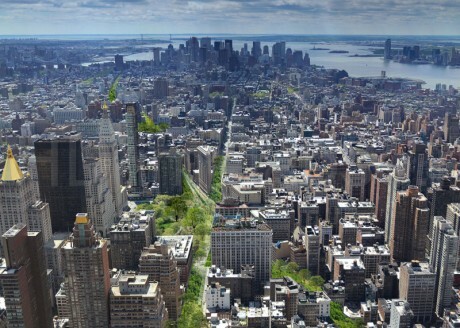 The Green Line would create a green corridor along Broadway, connecting Union Square in the south to Central Park in the north. Including the area of the park, this would effectively create a five mile green corridor from 14th to 110th streets. Beside the obvious benefits of adding a natural retreat right through the center of Manhattan, the Green Line would offer many other benefits. By absorbing water, the grass would clean local waterways and stormproof the city. Gizmodo speculates that the removal of cars might actually aid in the flow of traffic as it proved to have done when NYC closed off Times Square to automotive traffic. And having several miles of protected bike/pedestrian friendly thoroughfare would surely reduce traffic fatalities. The Green Line would also connect and expand a number of existing natural outposts and pedestrian malls such as Madison Square Park, Herald Square and Times Square. And unlike the elevated High Line which is on the far west side of Manhattan, the Green Line would be on street level running straight through the middle of the city, making it very likely to be enjoyed by people other than tourists (I love the High Line, but it belongs far more to the tourists than it does New Yorkers). It is often argued that large cities hold the key to a sustainable future for humankind–they are denser, leading to smaller homes with reduced energy needs and far greener transportation systems. But other research suggests that people who spend time in nature are happier than those who do not. The Green Line and other projects like it, might enable people to have their city and nature too. We hope it gets the greenlight. “If You Love Nature, Stay Away From It.” Agree? If you can see skyscrapers, I wouldn’t say you’ve retreated into nature. Even central park is a pretty sterile environment as far as wildlife goes. But if you spend your life in NY, I suppose it’s pretty wild by comparison. it’s definitely relative to your normal experience.